Members of the junior fair board hold some of the homemade Valentine cards, which will be delivered to local senior living homes ahead of Valentine’s Day. Emma Michael, member of the junior fair board and Scissors to Sheep 4-H group, works on a Valentine’s Day card, along with several other fair board members, at Alvetro Orthodontics, Tuesday, Feb. 5. 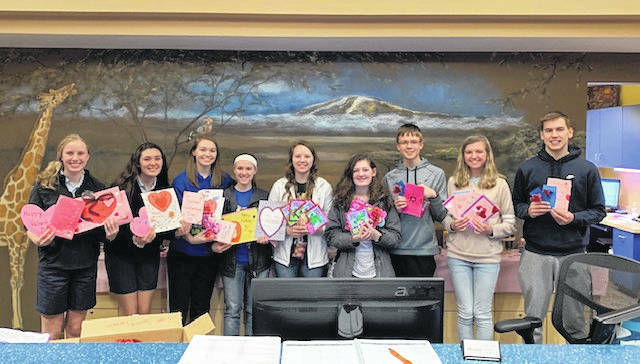 SIDNEY — For the second year in a row, Alvetro Orthodontics has teamed up with local 4-H groups to deliver homemade Valentine’s Day cards to area senior living centers. According to Darla Bowling, clinical coordinator at Alvetro Orthodontics, the business regularly participates in community outreach and tries to do something “special” each year. Last year, Bowling approached Cassie Dietrich, Shelby County 4-H youth development educator, with the idea of holding a competition among 4-H clubs in the county to see which could produce the most Valentine’s Day cards. The winning group — Starting Farmers — was given the prize of a pizza party after creating over 660 cards. All participating groups were also given grocery store gift cards to buy supplies or snacks for 4-H meetings, Bowling said. “Dr. Alvetro was so overwhelmed by participation last year,” she said. The Starting Farmers participated again this year, along with the Creative Clovers, Fort Loramie Livestock, Anna Livestock, Russia Livestock, Progressive Livestock, Merry Mod Makers, Scissors to Sheep, McCartyville Producers, and Houston Livestock clubs. This year, Alvetro Orthodontics also opened up the competition to include their patient base. 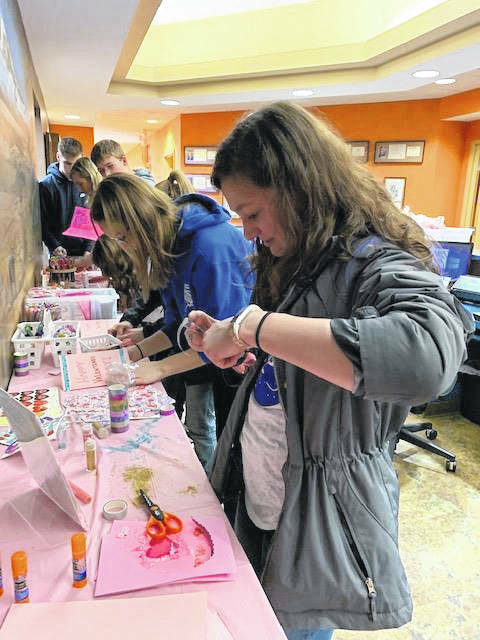 Patients were given from Jan. 1 to Feb. 5 to donate homemade cards. “We have an incentive program here, and when a patient starts in fixed appliances, or braces, they receive a rewards card,” Bowling said. “There are three criteria that patients have to meet in order to collect reward points; they have to be on time to their appointments, have great dental hygiene, and have no broken equipment. Patients who participated in the Valentine’s Day competition by making cards received 10 points on their reward card. They also received a ticket to go into a raffle drawing for a Bluetooth speaker. In total, Bowling said, more than 1,500 cards have been created. The 4-H group with the most cards will receive a pizza party at their next meeting. Members of 4-H groups, along with Alvetro Orthodontics employees, began passing out the Valentine’s Day cards on Thursday, with Ohio Living Dorothy Love as the first stop. Cards will also be delivered to Landings of Sidney, on Monday, Jan. 11, and Fair Haven, on Tuesday. Also new this year is the addition of the Limelighters, a Lehman Catholic High School a cappella group. As for the reception from those at the senior living homes, Bowling said said last year was a great success.